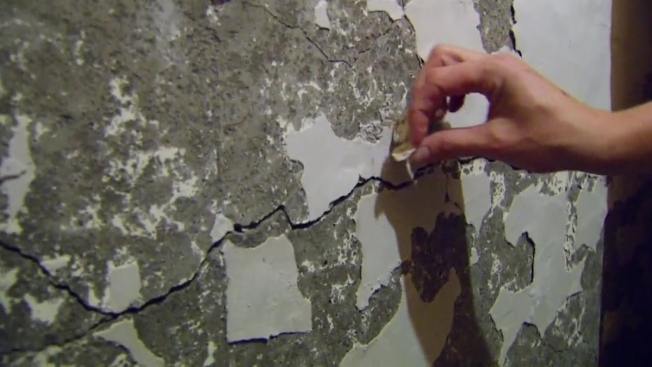 More than 150 Connecticut homeowners have filed complaints with the state because the foundations of their homes are crumbling and a legislative committee is discussing legislation today that would provide help to affected residents. This is an issue the NBC Connecticut Troubleshooters have done dozens of stories on. Contractors said the cost of replacing a crumbling foundation is at least $150,000 and some homeowners have filed a federal complaint, claiming insurance companies are purposefully working against them, and all homeowners who have crumbling foundations. Don Childree, a contractor who testified before the General Assembly’s Planning and Development Committee on proposed legislation, said he believes thousands of homes in eastern Connecticut are affected. Bill 5522, An Act Concerning Homeowners Insurance Policies and Coverage for the Peril of Collapse, is meant to help homeowners by requiring homeowners insurance policies to provide coverage for the peril of collapse and mitigation undertaken to prevent the house from falling down or caving in. Opponents of the bill argue it would raise insurance rates. Lawmakers are also considering a bill that would provide tax deductions for uninsured property losses. The bill is now before the Insurance & Real Estate and it's one of several scheduled to be considered today. The meeting begins at 10 a.m. in room 2D of the Legislative Office Building in Hartford.